Eli Lang isn't a new-to-me author, but it feels as if she is, after struggling with Half previously. The writing seems different – the voice – and it was easy for me to escape into Micah's narration. There's something about Escaping Indigo's Bellamy that compels and intrigues Micah, and it seems the reaction is mutual. The pair lean on each other, finding comfort and strength. After Half, I was hesitant to read more by Eli Lang, but with the emotions painted across the pages, I am interested in exploring more of her works in the future, as well as more in this series. The imagery when it came to the music industry and the inner most thoughts musicians go through was highly realistic, setting the scene and placing me in the moment without purple prose and over-description. The aftermath of losing someone important in your life – the grief – was also realistic, as was the way anxiety was written on the pages. I could empathize with Bellamy on several fronts, both with the anxiety and how you feel a part of this world, yet apart from it. An observer, with your head in your art, never knowing if said art is good enough, no matter how many say it is. While I loved the premise and the sweet, wounded boys on the pages, the pacing stalls around the halfway mark, slowing down to a crawl, without anything new added to the story. I just needed a little something more, but not necessarily strife or unnecessary conflict. In the end, pacing issues aside, Escaping Indigo was an emotional read, yet relaxing because of the pacing and lack of conflict. A hurt-comfort read. I recommend to MM romance fans, as well as those who enjoy stories featuring musicians. I really didn't like this book at all for a few reasons. First, there was soooo much inner monologue and not enough dialogue. I like when my characters talk to each other, interact with each other besides just asking if they are alright. Second, I was skimming and bored most of the book. After about 40/45% I got to the point where I didn't care how things turned out. Between Bellamy's anxiety and Micah's grief, it was just a big ole ball of depression and nothing seemed to make the book any better. Totally not for me but I am sure other people will enjoy it. This story is pure emo angst. I was expecting a typical rock star romance and I was thoroughly unprepared for this story about two tortured artists. After Micah’s best friend and bandmate dies, he finds himself on the road, acting as a roadie for his favourite band. Bellamy is the face of the band. On stage, he is a skilled musician and a larger than life entertainer. In private, he is often paralysed by anxiety. This is a beautifully written story. The prose is gorgeous. Descriptions are wonderfully sensual and observations are sensitive. This story is told from Micah’s point of view. Micah quietly studies Bellamy and his band while reflecting on his own life. At times, this is a torturously slow and emotionally intense story. Micah and Bellamy first communicate through music and art. Very gradually, they recognise something in each other and forge a connection. Neither man fully understands his own issues and needs, and they find it difficult to support each other. Other than some personal growth, not much actually happens in this book. I’m trying not to be too critical because know I’m not the target demographic for an emo new adult romance. However, I do have to admit that by the end I was a little bit bored of Micah, Bellamy, and their dramas. This is the first in a new series, and it is quite different to any rock band romance I have ever read. It is also much more a study of the minds of two musicians, than a standard MM story. If you like your stories fast paced and full of action, this will not be for you. It is evocative, thought-provoking, and very emotional. I confess to not being someone who enjoys pages of inner thoughts, so I did find it a bit frustrating. By complete coincidence, I was reading this whilst at a festival, so I decided to stick with it and see whether it would give me more insight into the members of the bands I was watching. It also gave me moments of deep thoughtfulness when surrounded by noise and activity. Without doubt, this book will give you a continuous insight into the thoughts of a man who is struggling with grief, falling in love with an equally tortured soul, and following their dreams to live a life in music. 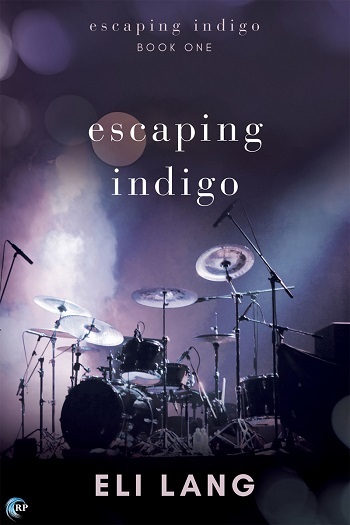 Reviewers on the Wicked Reads Review Team were provided a free copy of Escaping Indigo (Escaping Indigo #1) by Eli Lang to read and review.